Stephani Robson ’88, MS ’99, PhD ’10, in the Statler’s Regent Lounge. “My students laugh at me,” Hotel school senior lecturer Stephani Robson ’88, MS ’99, PhD ’10, says with a smile, “because I always tell them the correct answer to any question is, ‘It depends.’” An expert in environmental psychology—focusing on the intersection between design and behavior in hotels and restaurants—Robson studies myriad topics relating to hospitality, an industry in which expectations vary widely according to factors like price, clientele, and location. The Canadian-born Robson came to the hospitality world via an unlikely route: she ran out of money while bumming around Europe after high school, and rather than bailing her out, her parents told her to get a job; she wound up working in the kitchen of a Welsh summer camp and loved it. After graduating from the Hotel school she worked for a Toronto firm designing commercial kitchens, and in 1993 was recruited back to the Hill to teach that subject. She earned her grad degrees—an MS in design and environmental analysis from Human Ecology and a PhD from the Hotel school, concentrating on consumer behavior in restaurants—while teaching full time. The Ithaca Marriott’s book-lined lobby, which Robson helped design. 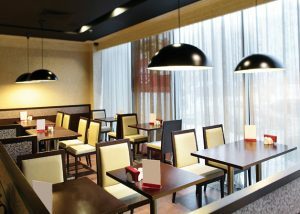 In addition to teaching courses in restaurant design and development, Robson consults for industry. 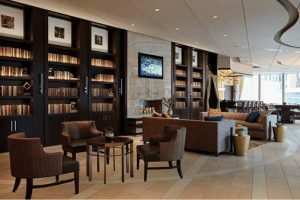 Visitors to Ithaca’s new downtown Marriott have her to thank for its book-filled lobby: she recommended an academic-themed atmosphere to appeal to the hotel’s primary market, travelers headed to Cornell or Ithaca College. Your work on the space between restaurant tables—the subject of your PhD dissertation—has gotten a fair amount of press. Is packing more people in a trend? It’s not a trend from a design perspective; it’s a survival mechanism. Restaurants have a slender profit margin, so they’re going to use every edge to increase profits. Restaurants don’t sell food, they rent space: the more you buy, the more space we can afford to give you. That’s why in a fancy restaurant you have lots of room, but in an inexpensive one you’re packed in. In my study, I found that people prefer a distance of between twelve to sixteen inches between tables along a banquette. But from a restaurant operator’s perspective, that’s not great; at that distance, you may have lost some space that you could squeeze another table into. To the layperson, the idea that restaurants sell space sounds crazy. Wouldn’t most people say they go to a restaurant for the food? That is the reason you’re going, but the restaurant owner wants to maximize the revenue from you while you’re there. For a takeout place like McDonald’s, most of the revenue comes from people who buy food and leave. But if you’re a sit-down restaurant, your inventory is the seats and the time people spend in them; the food is what brings people in and what they pay for. If my restaurant is open ten hours a day and there are ten seats, that’s 100 seat-hours. If I can turn your table quickly, or if I keep you there longer and you spend more money, that’s going to increase my revenue per seat-hour. What about places like Starbucks, where some people sit all day sipping one cup of coffee? Starbucks makes a lot of their money on things that leave the store—takeout coffee, products like beans or grounds. So they’re happy to have you sit all day using the free wifi, because you are a lure to others. Humans are herd animals; we like to go where other people are. You’ve also done work on restaurant seating preferences. Where do we like to sit? Generally, up against something. Humans don’t have very good peripheral vision and we don’t like people approaching us from behind. We like to be up against walls or in corners—that’s why everybody loves booths. The only time you’ll pick something that’s not anchored in that way is if you have no choice, or if you want to be seen. Also, in our culture, space is status. If you’re on a date, you want a table in the window or a corner booth because it’s the status location. The middle tables are low-status—unless it’s a really famous restaurant, then it’s status just to get in. If we know that people prefer booths or window tables, why is it that sometimes you walk into a mostly empty restaurant and the hostess seats you in the middle of the room? They’re balancing the servers’ workload. If you seat too many people in one station, they can’t provide good service. If I just sat a party of four in that station, I’m not going to sit another six there. That’s why when you ask for a different table, sometimes they go “ugh.” It’s not that the hostess doesn’t love you, it’s that they’re afraid that the server won’t be able to provide good service, you won’t be happy, and you’re going to say bad things on Yelp. If I’m happy with my table, am I going to spend more? The research I’ve done has suggested yes. The jury is still out because I haven’t tested it in all kinds of restaurants, but I’ve found that window tables and booths tend to generate a higher average check. But there’s another element: if I’m a restaurant and I’m waiting for your table, I want you to leave. That’s why large parties—which take the longest—are often seated at the worst tables; if I need those seats back, I’m going to put them in the least desirable part of the restaurant, to turn those tables and get another party in. Restaurants also use music strategically. If they want to turn their tables, they play faster music. You’ve also done research on the hotel industry. Could you talk about your work on how people surf hotel websites? My colleague at Penn State, Breffni Noone [PhD ’04], and I wanted to see what role photos play in hotel choice, so we had people choose hotels online and used eye tracking to see exactly what they looked at. We found that pictures, unsurprisingly, are enormously important. But we also found that people will look at pictures—like of conference rooms—that have nothing to do with their actual travel experience. At a low price, people look at pictures for reassurance. At a high price, they look at them to confirm it’s worth the money. A room in a “pod” hotel. 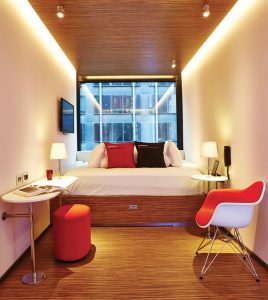 Is the new micro-sized “pod” hotel a viable option? Absolutely. I stayed in one in Paris and loved it. The rooms are modular, finished in the factory. They have everything you need, with a window and a king-size bed. They’re cleverly designed, quirky, and fun, and everything is controlled by an iPad. The hotels put money into the public spaces—you can get something to eat and drink and interact with people. The wifi is blazingly fast. From the owner’s perspective, these hotels are faster and cheaper to build and you end up with more rooms per square foot, so you can generate more revenue. Another trend you’ve talked about is that hotels are getting rid of minibars. Why is that? Minibars are expensive. They use energy and take up space. The staff has to constantly check to make sure you paid for what you took, clean them, and keep them stocked. If you get charged for something you didn’t take, you get upset. So one trend is to have a pantry downstairs where you can buy what you want—and if I’m a Courtyard by Marriott, that’s fine. But if I’m a Four Seasons, that’s not appropriate. So in some high-end hotels, we’re seeing a small pantry on every floor. It has a coffeemaker, a fridge with sodas, a big basket of cookies and pastries; in the evening they put out cheese, crackers, and whatnot, and guests take what they want. What about the trend toward getting rid of desks in hotel rooms? It’s a generational thing. Today’s worker doesn’t use the desk. And if you’ve got 400 rooms and buying a desk is $500, to say nothing of the chair, that’s a $200,000 investment. If we can eliminate that and give you a smaller surface next to the bed where there’s a plug, why have a desk? If people want to work at a communal table in the lobby and have other people around them, that’s where you should put your money as the developer. Then you can shrink the rooms a bit and have less furniture, and maybe that translates into a lower rate for the guest. Are alarm clocks also disappearing from hotel rooms? Yes, because everybody’s using their phones. We’re also now seeing people using their phones as their room key. In ten years, we’re going to laugh at the thought that you didn’t do everything on your phone. What about beds? It seems like there’s an arms race to provide the best mattress. That started twenty years ago with Westin’s “Heavenly Bed.” They put money into good mattresses, and everyone else thought they had to have that too. Today, when your room has a bad bed, you’re more likely to say so on TripAdvisor. Online reviews have changed so much about our business, whether it’s restaurants or hotels, because there is a much larger audience for complaints—which means the stakes are much higher. How are hotel bathrooms chang­ing? The bathtub is going away in most hotels, because most Americans shower. It depends on your target customer. If you get a lot of people from Asia or families, you’ll keep the bathtub. If you get business travelers, they take showers. It’s also easier to clean a shower stall, and there are fewer injuries because attendants aren’t on their hands and knees. Do you have any particular hotel room pet peeves? The bathrooms seem to be skimping on towel hooks. They’re driving me nuts and I tweet about it all the time. In theory, two people could stay in a king room, but there’s only one hook. So where do you put the second towel? You’re telling us to save our towels—don’t give me a hook where the towel hangs there and stays wet all day. Give me a proper one where I can stretch it out. Same thing at the sink. They give you rolled up towels and there’s no place to hang them. So why aren’t there more hooks? It’s the owner saying, “We need to get this room built for $35,000, and we’ve got to have a great bed, a good showerhead, good lighting, a top-notch television.” So what gets cut are the little things. “People aren’t using the clock radio, so we won’t have it. Let’s make the bathroom look great, but can we save $50 a room on hooks.” They think they’ll save money—but what they’re really doing is making me unhappy.